Replies: 47 (Who? ), Viewed: 96071 times. 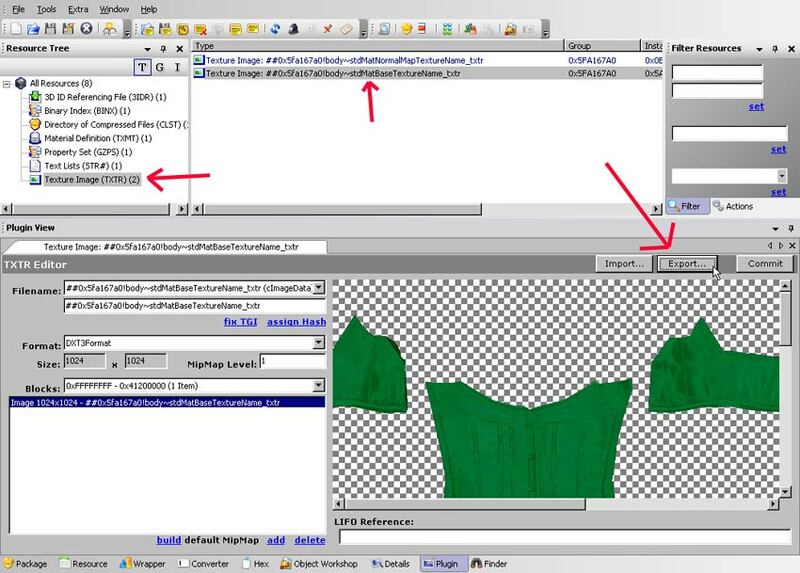 This tutorial will take you through the necessary steps to replace the Maxis default meshes and clothes that are used by the game's NPC's (maid, mailcarrier, exterminator, etc). Much if not most of this tutorial is a duplicate of the great tutorial written by WDS BriAnna which can be found here: http://www.modthesims2.com/showthread.php?t=43092 If you're having difficulty understanding this tutorial, I suggest you read that one also. Because it is so similar, in this tutorial I will show you a different way of doing it by using SimPE's Resource Finder plugin, and using a trick of mine to prevent long loading times. 1. Download and install the latest version of SimPE. 1.a. Install the Microsoft .NET framework if you don't have it. 2.Find a mesh and matching clothing that you want to use. *Explanation: There are two types of "bodies" in the game. Some are made of a single piece (mesh), such as a formal evening gown mesh, and some are made of two pieces, top and bottom. This corresponds to when you're making a Sim in "create a family" and you can either choose clothing that is one-piece or has the top and bottom separate. I'll show you how to use this to replace the female maid NPC. First, right-click on your Desktop and select New > Folder (you can delete these when you're finished) and name it MooMesh. Right-click again and select New > Folder and name it OriginalMesh, and make another named OriginalTexture. Start SimPE and open the MeshMooMaid42505.package file. In the left pane, you will see a list of Resources. Left-click on Geometric Data Container (GMDC). Now you will see it by itself in the right-hand pane (packed files window). Right-click on this (the name right under where it says "type") Geometric Data Container and select "Extract" from the drop-down menu. A box will pop up asking you for a save location. From the pull-down "Save in" box, select Desktop, double-click your "MooMesh" folder and save it in there. From the SimPE menu, select File > Open and open 5fa167a0_SanmooMiniMaid.package so we can get the textures. 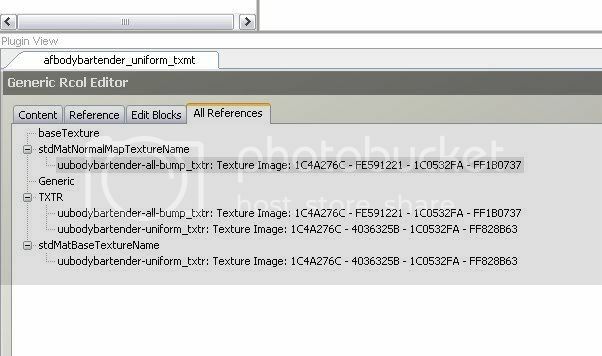 In the left pane (resources), left-click on "Texture Image (TXTR) (2)". In the right pane you'll now see the base texture and the normal map texture. NPC outfits don't use normal maps, so we don't need that. Left-click on the file ending in "body~StdMatBaseTextureName_txtr". On the bottom bar of SimPE click on "Plugin" if it's not already selected and you should see the green maid outfit. In the Plugin window click the Export button and save the image to your desktop. Now we need to hunt down the NPC maid's mesh and texture. On SimPE's bottom bar, click the "Finder" button. If there's not one there, go to Window > Resource Finder. In the Resource Finder pulldown "Match" menu, select "Regular Expression", type in ".*maid. *gmdc" (That's dot star maid dot star gmdc) and click the Start button. Be sure you're searching in Namemaps. Now you'll have to wait patiently for a bit. In a moment you should see your search results. Eight results or so (dress, hair, body, vehicle). We want "afBodyDressMaid_tslocator_gmdc". Double-click afBodyDressMaid_tslocator_gmdc in the search results. Now you'll see that SimPE has opened Sims03.package. Do not do anything yet! Do this "trick" I learned to avoid SimPE's long loading times: On the upper-right side of SimPE, click the magnifying glass icon labeled "Filter". Click the Pin (auto-hide) icon on the pop-out menu so it doesn't vanish on you. Now in the filter, type in a nonsense number and click SET. This effectively prevents SimPE from trying to load all the file's resources. Now that you've done that, in the left pane (resources), left-click on Name Map. Now delete the nonsense number you typed in the filter box and click SET again. The Name Map should appear in the right pane. Left-click it and at the bottom of SimPE, click the Plugin view. This will bring up the File Map Editor window with all the names. On the bottom-right of your screen is a box labeled Finder, Filename:. Type in "afbodydressmaid" and SimPE will automatically scroll down to the "lod15" entry (we NEVER want any files with "LOD" in the name). In the left window you'll see just below the highlighted name is the file we want. Left-click on that (afbodydressmaid_tslocator_gmdc) and it will appear on the right in the "Properties" box. Highlight and Copy the Instance number. 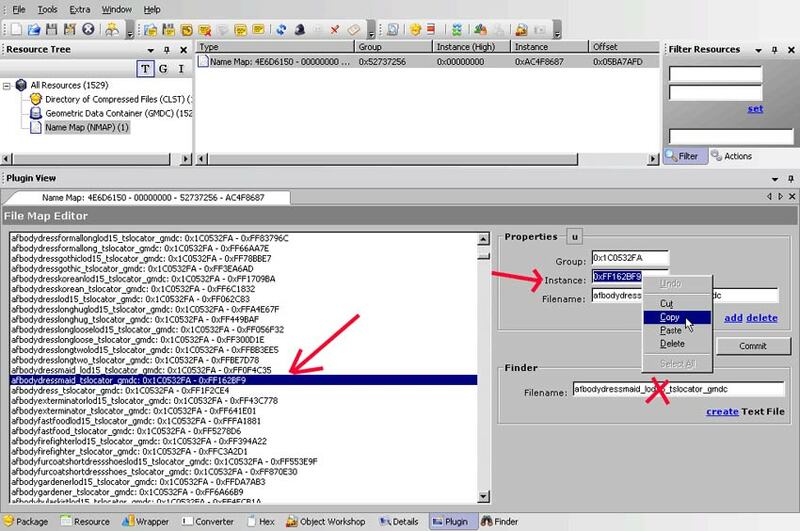 Paste the Instance number in the Filter box you used earlier and click SET. 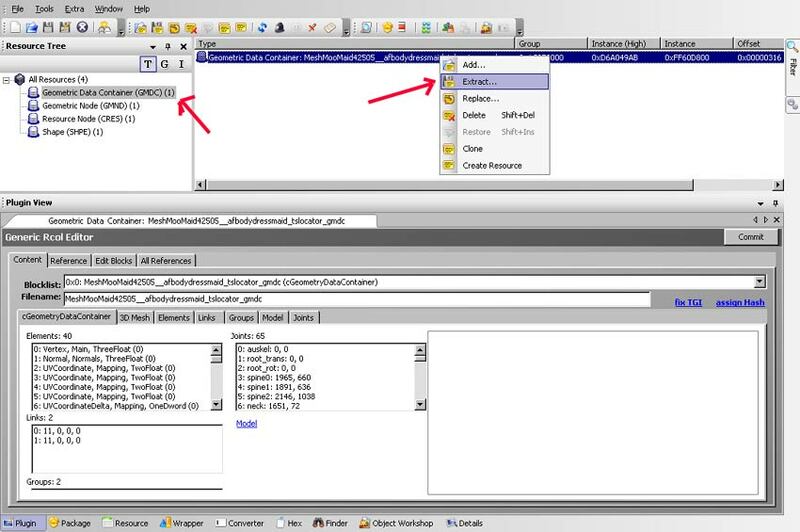 In the left pane, left-click on Geometric Data Container and you'll see a single file appear in the right pane. Left-click on that file in the right pane and wait a moment while SimPE loads the file, then right-click it and select Extract and save it to your OriginalMesh folder. Now that we know the name of the file we're searching for, we can narrow our search. At the bottom of SimPE, choose the Finder again and this time we'll use "Regular Expression" and .*afbodydressmaid. *cres for our search. Note that sometimes it can get flaky and you may need to close and re-start SimPE if the search seems to take 2 seconds and you get no results. Follow the above procedure again (double-click Resource Node: afBodyDressMaid_cres in the Finder results, when you see SimPE has opened Sims06.package, select Name Map, then clear and SET the Filter number, switch to Plugin View, find the name and Instance number, set the Filter number and click on Resource Node (CRES) (1534) in the left pane, Extract the file to your OriginalMesh folder). Do the same for .*afbodydressmaid. *gmnd and .*afbodydressmaid. *shpe, extracting and saving them to your OriginalMesh folder. Once you've extracted and saved all four files, from SimPE's menu select File > New. Right-click in the empty space in the right pane and select "Add". SimPE should by default open your OrignalMesh folder where you saved the files. Add all four files ending in .XML and select File > Save and save as whatever you want to call it. I'll name mine "Targas_Maid_Mesh_Replacement". Save it in your Downloads folder. Go back to Finder > Regular Expression and type in .*afbodydressmaid. *lifo and click Start. You'll get "afBodyDressMaid-whitelace0_lifo and whitelace1_lifo as your results. Follow the same procedure as above, this time extracting to your OriginalTextures folder. Do this for both the 0 and 1 whitelace files. Once you've done that, change your Finder search to .*afbodydressmaid. *txtr (found in Sims07.package) and extract that also. Select File > New again and this time add the .xml files from your OriginalTextures folder and save that file with the name of your choice to your downloads folder. *Explanation: The mesh file and its associated information, extracted directly from the game files and saved in your Downloads folder is now the new information source the game will use to load a maid's body. The same is true for the textures, so anything you put in there will now replace every female maid in the game. In SimPE's menu, select File > Recent Files > and open your Orignal Mesh package. In the left pane, left-click on Geometric Data Container and in the right pane right-click and select "Replace" from the menu. Browse to your folder named "mesh" (where you extracted Sanmoo's minimaid mesh) and select the xml file. SimPE will pop up a box saying the resource has changed. Click yes and then save the file. By using "replace" you've placed a different mesh in the file, but the game will still see it as the default maid mesh. Open the image of Sanmoo's green dress you exported in the beginning of this tutorial in PSP or Photoshop and resize it to 512x512, save it under a different name (as a .png file), resize it again to 256x256 and save again. Open the Original Maid texture package and click on the file name in the right pane ending in "whitelace0". In the plugin view, click the Import button and import Sanmoo's original image. Click the Commit button. Replace "whitelace1" with the resized 512x512 image, and whitelace_txtr with the 256x256 image. When you replace this one, you'll see it has a number of entries instead of a single image. Right-click on the 256x256 image and select "Update all sizes". Be sure to commit after every change. Save. Go in-game and call a female maid and you'll have a Sanmoo maid! Some names you can search for: barista, maid, maildelivery, gardener, exterminator... the list goes on. If you want to find more names, you can run the Object Workshop in SimPE and look under "Other > Outfit". Note that if it's a teen NPC you'll need to use a teen-sized mesh. **"Quick and Dirty" method: Technically, to replace the mesh all you need is the Geometric Data Conatiner (GMDC). This is all I use when I do it, because it reduces file size. However, SimPE can sometimes give you error messages when you attempt to replace the mesh with your own, because SimPE is looking for a so-called "complete" file, so it may take a couple of attempts and re-starts of SimPE to get it to work if you get "no parent found in search path" errors. 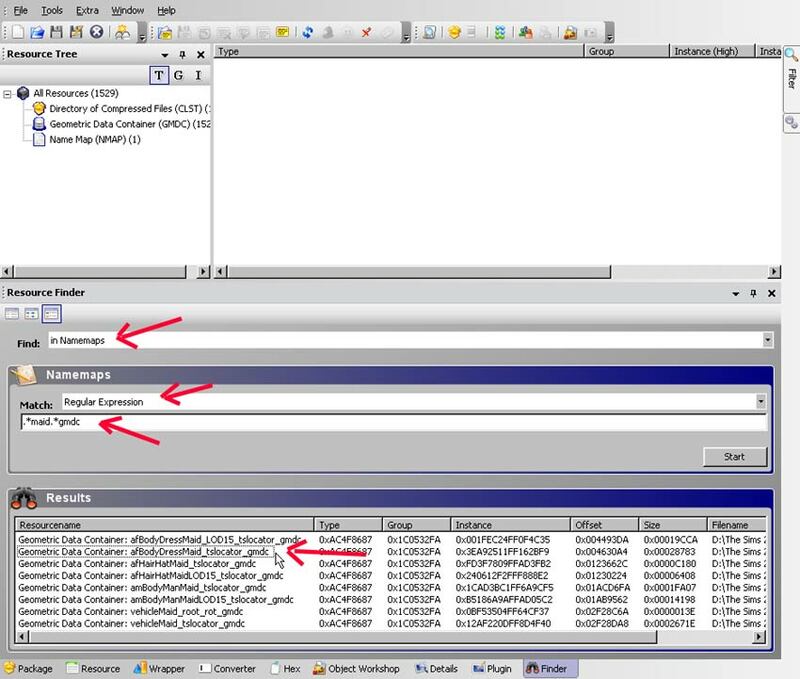 With this method you only extract the Geometric Data Container and not the CRES, GMND, or SHPE files. File > New in SimPE and add the extracted .xml of (as in our example) afBodyDressMaid_tslocator_gmdc and save. Replace this with the .xml of your own mesh and it will work just as well as having the full 4-file package. lefourbe, I hope to see your screenshot of your new maid. Update: July 2009-I am back now to make invisible and tranparent recolors again in sims 2. You can pm me if you want your objects to be invisible and transparent from now. #4 14th Oct 2005 at 6:08 AM Last edited by Targa : 14th Oct 2005 at 6:16 AM. afbodymaildelivery and ambodymaildelivery for the mail people. afbodygardener and ambodygardener for the gardeners. Using the finder you can simply type "gardener" or "delivery" also, if you're using the "contains" search function. Glad to see someone's using this and having success. Try using .*mail. *lifo and .*mail. *txtr for the mail delivery textures. The reason you can't find the gardener textures is because of a Maxis typo. The name is "gardner" (missing an 'e'). Try .*gardner. *lifo and .*gardner.*txtr. The file name is aubodygardner-femaleoutfit and aubodygardner-maleoutfit I believe. Targa's No Pillow Fights mod. Thank you Targa for the detailed tutorial! 6th Nov 2005 at 1:54 PM Last edited by BlueAngel : 6th Nov 2005 at 2:02 PM. Mesh file says Geometric Data Container (1) but nothing opens? This message has been deleted by BlueAngel. Reason: Must have hade trouble with the memory on my computer or something � works wonderful now. Thanks so much for this tutorial! Suppose we want to use a mesh that came with the game for our NPC? Is there a way of doing that? Uhm, WHERE is this "MeshMooMaid42505.package" file? Please explain more for those of us who've not done anything like this before! The first step to perform, when following a tutorial is... uhm... read it! Open that page and download the zip: the package you mention is inside that zip. This tutorial only explains *one* of the possible applications: the maid. Once you have understood the method used in this tutorial, you can modify the nanny with any clothing you like (not provided by the tutorial). Just be sure to choose a clothing made in one piece (not with separate top and bottom), and that the clothing is for elder female. This message has been deleted by groovy60s. #12 14th Jun 2007 at 4:59 AM Last edited by groovy60s : 14th Jun 2007 at 11:53 PM. Reason: I found a problem in my game. This is an easy tutorial ! thanks ! can we change the head/face like this too ? This is a terrific tute, and I've followed it faithfully and had it work for the maid. Thankyou. There don't seem to be any afBodybartender, or amBodybartender.txtr files -- no /Sims07 files, either, but when I do a search removing the . *txtr from the filename search there are files named afbodybartender_uniform_txmt along with the mesh components (gmdc etc). The male gives the same (or similar) list, so I'm presuming they're referencing the same texture? Or have a stepped wrong, somewhere? Yes, the "uu" prefix indicates that the files are used for both genders. You can use the finder, type "uubodybartender" and you'll get all the references; then double-click the txtr line and the sims07.package will open on that file. Now, just to check: I am presuming that means that I can't use a different texture for male and female bartenders, correct? Well as everything Sims 2, there has to be way but it would be more complicated... Never tried it so I can't help much more here, sorry! #19 14th Oct 2007 at 1:16 AM Last edited by mogbog123 : 14th Oct 2007 at 9:00 AM. umm..help..i dont have GMDC in my rescource tree, whats wrong ??? Elections are won by men and women chiefly because most people vote against somebody rather than for somebody. No problems at all. Thankyou for your help. is there a way to do this with recolours / clones? i don't have any decent meshes to use for my project (yes im uploading it). I'm gettin' stuck at the number thingy.. There wont appear 1 file even tho I entered the same number like before. Be sure to clear the instance filter and click SET, otherwise you won't see anything. IIRC, this sounds like what's happening to you. How would I be able to easily replace the entire NPC to look like my character or turn a clone of my character into the default NPC ?